Families affected by pre-existing conditions attend a news conference on Capitol Hill in Washington, Tuesday, June 26, 2018. In 2017, Republican conventional wisdom was that repealing the Affordable Care Act was the ticket to re-election this year. But, it turns out, Americans appreciate the protections included in the landmark law, which Republicans nearly repealed last year. This is especially true of protections for those with pre-existing conditions, which could include half the non-elderly U.S. population. So, this election year, Republicans are turning themselves into pretzels to profess their longstanding support for protections for American with pre-existing conditions, which range from acne to diabetes to cancer to depression. This is a difficult contortion for Republican House members, including 2nd District Rep. Bruce Poliquin who voted in May 2017 to repeal the ACA and replace it with the American Health Care Act. That inferior plan had weaker protections for those with pre-existing conditions (under the guises of greater flexibility for states) — and allowed insurers to charge these people much more than their healthier counterparts — that would have led to more than 23 million Americans losing their health insurance by 2026, according to the nonpartisan Congressional Budget Office. It also would have done away with the requirement that plans cover “ essential health benefits” such as prescription drugs, emergency services and maternity care. Poliquin and Gov. Paul LePage now argue that their efforts to undo the ACA aren’t so bad because Maine law protects those with pre-existing conditions. State law includes some protections for people with pre-existing conditions, but they are weaker than those in the ACA, they could change and Mainers aren’t so self-centered that we don’t care about people in other states who don’t have such provisions. Nearly half the state’s population — 590,000 Mainers — has pre-existing conditions, according to Sen. Susan Collins’ office. She was the first Republican senator to say she would vote against a repeal and replace bill in the Senate. That bill, which was to be meshed with the House-passed bill, was rejected by the Senate in July 2017, thanks to the opposition from Collins and fellow Republicans Lisa Murkowski and John McCain. Health care is the top concern of voters nationally and in Maine. 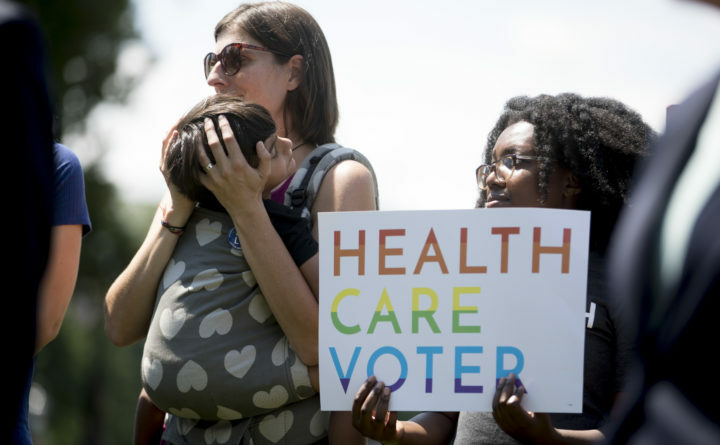 Digging deeper, continuing protections for those with pre-existing conditions was the top health concern, according to a Kaiser Health poll. That’s why many Republican have had to change their tune. President Donald Trump has also joined the charade. He has been touring the country telling people that his administration will always protect people with pre-existing conditions. This is absurd because his administration is now part of a Texas lawsuit arguing that the mandates to cover pre-existing conditions are unconstitutional. Collins had urged the Department of Justice to do the opposite — to defend protections for people with pre-existing conditions. LePage joined the lawsuit in February, as an individual, not as the chief executive of Maine because he can’t do so without the approval of the state’s attorney general. In February, the Trump administration issued rules allowing an expansion of the sale of short-term health plans. These plans can be denied to people because of the health history and higher premiums can be charged to those with pre-existing conditions. Plans can be structured to appeal to only young and healthy buyers. Just days ago, the Trump administration approved ACA subsidies for skimpy health insurance plans that don’t offer a full range of benefits. These plans don’t cover essential health benefits and can be denied to people with pre-existing conditions. In the case of Republicans and pre-existing conditions, actions speak much louder than words. Their actions show that their new-found affection for protecting people with pre-existing conditions is shallow and simply meant to carry them through Tuesday’s election.